Atlantic Avenue is a distinctive retail corridor in Brooklyn and New York City. From end to end, Atlantic is becoming a more and more attractive place to locate. At the eastern end of Atlantic Avenue destination businesses are taking advantage of great proximity to the Atlantic Terminal transportation hub and the basketball arena. Similarly the western end of Atlantic Avenue is experiencing a renaissance with its great proximity to Brooklyn Bridge Park, Pier 6, a regional park that families and young people flock to from around the region. Distinctive boutiques and historic 19th century architecture anchor the center of the Atlantic Avenue district from Court Street to Bond Street and attract people from all across the City. 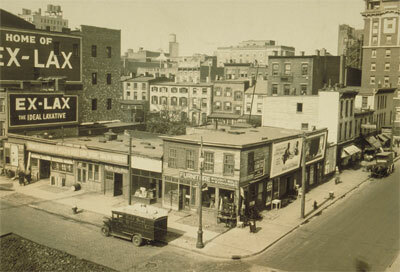 The history of Atlantic Avenue as we know it today, began in the 1700s. It was first a private road terminating at Ralph Patchen’s farm on the East River. This country lane was swallowed up by District Street, which became the southernmost boundary of The Village of Brooklyn, incorporated in 1816. In 1855, District Street was renamed Atlantic Street, and by the 1870s it was designated an Avenue. 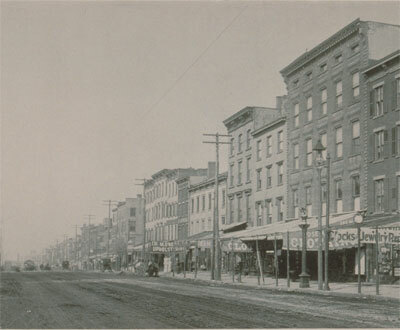 In the late 1800s, fashionable shopping along with waterfront, commerce, and manufacturing firms defined the Avenue. Along the blocks closest to Fourth Avenue, a mini-revitalization around the 1920s spurred construction of the YWCA of Brooklyn, the Times Plaza Post Office, and the Times Plaza Hotel. 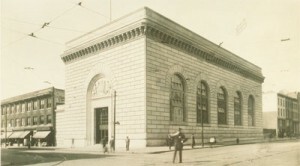 At one time the waterfront supported a thriving commercial port with regular ferry service to Manhattan. Vessels from all over the world docked here, releasing their international cargoes and crews. Businesses flourished and declined until the 1940s and 1950s when New York City began construction for the Brooklyn-Queens Expressway. Then any institution, falling in the pathway of the new Expressway, received it’s death knell. Only historical illustrations remain as witness to this part of the old Avenue, which ran to the East River. Brooklyn’s early development began closest to the River and spread up the Avenue — spurred by the Brooklyn-Manhattan ferry, which commenced service in 1836. Many of the buildings on these blocks date from the 1850s. The block between Henry to Clinton Streets is known as “Restaurant Row.” Over the past few decades, a diverse collection of fine dining experiences have developed. These establishments now attract local and citywide diners to sample a smorgasbord of international cuisine. Many of the buildings here date back to the 1850s when Journeay & Burnam’s dry-goods store (at 124-128) offered the height of fashion for Brooklyn shoppers. Around the 1930s, an influx of Middle Eastern immigrants settled and established businesses between Clinton and Court Streets. Their restaurants and shops offer specialty foods from the Middle East as well as Mid-Eastern music, books, clothing, and other assorted items. Today the fame of this block extends well beyond the five boroughs. In the late 1800s, the anchor of this block was the South Brooklyn Savings Institution at 160. The density of antique dealers from Hoyt to Bond Streets is exceptionally high — thus it is knows as “Antiques Row.” In the 1960s and 70s, antiques shops began to cluster here, as well as on adjoining blocks, spurring an economic revitalization. Today the antiques shops have been joined by other intriguing furnishing stores, many of which sell contemporary designs by Brooklyn-based artisans. Some of the Italianate-style buildings on this block feature original Victoriana details. The odd-numbered side of the block between Bond and Nevins Streets features two historic churches and a former factory, converted in 1975 to luxury co-op apartments. There is a magnificent stretch of historically accurate Victorian storefronts on the even numbered side of Atlantic Avenue, and the three remaining façades on the Italianate style structures across the street.